Shopping and dining in and around Allegan is a favorite past time of Allegan residents, as well as those who come to town for a visit. Folks rely on and anticipate the courtesies of small-town merchants: they know your name and ask about your family; they remember what you bought the last time; they wonder about your goings-on, from whence you came or where you are going. It keeps people coming back, because they like a place where it’s almost certain that everyone knows your name. Many businesses in Allegan have been around a long time, owned and operated by family members going back generations, such as Hunter’s Western Auto, where you can find just about anything — model cars, toys, and, most importantly, bikes for the whole family. McFarland’s Jewelers, Springrove Variety, Something Sweet, and Hathaway Cottage, as well as many other Allegan businesses embody the shopping history and strength of Allegan. Christmastime in Allegan is a wonderful time, too. Business owners decorate storefronts, participate in “Festive Fridays” from Thanksgiving to Christmas, and make the overall downtown shopping experience — holiday or otherwise — utterly delightful. Allegan is a proud antiquing community and is dotted with antique stores, hosting an antique show at the Fairgrounds the last Sunday of the month throughout the summer months. A strong artist community, the Allegan area offers a multitude of venues to buy art and artisan products. Baker Studio in Allegan is one such place, specializing in yarns and other textiles, as well as looms, and hosting a large artists’ venue during the holidays. 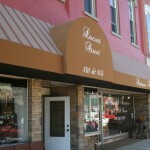 Allegan also offers a variety of eateries and food markets. The Allegan Farmer’s Market, open every Thursday during the summer months, is a popular destination for locally grown produce and homemade goods. You’ll find circles of co-workers and longtime buddies at the local diners. 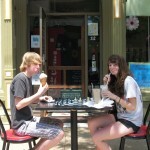 The Downtown Deli is always busy with folks on their lunch breaks. Juan Lin’s hopes that you’ll return for more Chinese food and hospitality. And you’ll have to arrive early to snag a seat at Dailey’s Kitchen, where Jack and Stella will treat you to from-scratch meals in their bustling bistro and their Smokeshack, and perhaps a song or two. For a final coffee or ice cream treat, head to Every Daze Sundae & Ice Cream Shop, ‘50s-themed Deano’s Ice Cream, or the Shiver Shack and head to the boardwalk for a downtown stroll. At Montage Market, a specialty food and wine store, you will find a variety of unique foods, like hummus, cheese, crackers, dips, as well as made-in-Michigan and international wines and beers. If you want more of what Montage has to offer, head out-of-town just a few minutes to The Grill House, owned and operated by the same family, and featured on the Travel Channel as a destination eatery, for grill-your-own meats and fish or for pub food. Your shopping and dining needs will be met in and around Allegan, Fennville, Saugatuck and Holland, and you’ll be enticed to return by the small-town charm and welcoming atmosphere that the proud merchants of the Allegan area evoke. Come join the fun!